So. What happened? Well, if you read the story, you discover that the EOTech branch sights have a problem called thermal drift, where the point of aim travels off zero under conditions of extreme hot or cold. This is especially important due to global warming. The comments are interesting. Like most right-wing there is a wealth of ignorance going on and I cannot abide that on a Monday morning. So, here we go again. That’s what happens when the 0bamachrist is in charge. No. These were purchased by elements of DOD FAR below the notice of the President of the United States or most of his chief minions. And they were bought the first time during the Bush Administration. Has any user who has died as a result of the faulty sight filled out and submitted the proper government complaint form regarding this “alleged” issue? Therefore, there is no reason for a bureaucrat to respond to this supposed issue. That is a pithy item about bean counters counting beans at the Pentagon (which is what I do) and I can tell you with absolute certainty that bean counters all along the chain care about this issue. The fact that military lawyers are involved in this as a contract issue tells you that lots of very senior people heard users complaining and are doing something about it. They couldn’t buy rifle sites from a real rifle site company. Oh no. The f*cking morons go to some corrupt company that manufactures absolutely nothing before the contract was let. Way too hard to go to Williams, Lyman, Niteforce , Leupold, etc and buy a f*cking site that works and my boy can laze a f*cking fly with and take out its left eye. Actually, EOTech was making quality sights long before the military showed up with our check. And EOTech sells more of their products in the civilian marketplace than the military can sales can hold a candle to. There is no reason to suspect corruption or malfeasance. The most likely cause of this failure is ego-centric buying decisions. And the military, police and federal agencies have also bought plenty of sights from all those other producers too. I wish I had a dollar for every time I have heard this STUPID statement. We have been hearing this since the invention of the AR16 (Give us back our M-14’s, we don’t care about the 50 years of data shooting the 5.56 is a militarily effective and lethal killing machine). We heard it about body armor (we want Dragon scale armor, not this lowest bidder contract military stuff). We heard it about armored vehicles (M113 my daddy used in Nam is better than that crappy new Stryker vehicle), and other armored vehicles (that Bradly is a death trap, bring back the M113 like my daddy had in Fulda Gap). And for the record, No one put their life on the line to fight for your freedom since the Reagan administration. Your freedom hasn’t been at risk by foreign powers and your freedom has been stripped away by your own government without anyone in the military lifting a finger to stop it. Go Trump! That’s his point. We used Trijicon when I was in. EO was cheaper, so Uncle Sam went with them. Guess what? They don’t work. That’s not how it works. “we” bought EO because the users in the filed demanded them. Uncle Sugar gave the troops anything they asked for. And Special Forces don’t even ask, they just get out their credit card and go get whatever they want. Some of what they want turns out to be defective or just simply not suitable for harsh military environments. But that doesn’t stop people with inflated ego’s from thinking they know what is best. All of the military services went on a spending spree buying civilian sights of all sorts of qualities and characteristics in the early parts of Afghanistan and Iraq wars. We beancounters didn’t tell anyone “no”. It was the lesson of Mogadishu. The commander in the field gets whatever he wants, even if the only reason he wants it is clever marketing. Special operators are not immune to clever marketing. And the cleverest marketing of all is selling stuff really cheaply to “special operators” and then telling your civilian customers, “LOOK! SEALS USE OUR PRODUCTS”. “Always remember your weapon was made by the lowest bidder.” Some guys spend their own money to get quality replacement parts. No. That isn’t what happens at all. Trijicon is not in any way the lowest bidder. Nor is EOTech. Nor did the military care. The military and other shooting agencies wanted what they wanted and they paid full market rates to get them. These were off the shelf purchases of brand name items, not contract proposals that developers bid on. If military guys today are using their own money to buy parts for their military rifles they are severely foolish about their weapons and their money. Being in the military creates no immunity from foolishness. a friend of mine bought several thousand dollars worth of equipment for his son before he left for Afganashitastan. Totally unnecessary. But whatever. Support the troops! Yay America! You are correct Barnslayer, not exactly new but worth bringing attention to because the pentagram has done nothing about the problem. The Pentagon doesn’t need to do anything about this problem. We already have a gazillion Non-EOTech sights that we can issue on a moment’s notice. If anyone is still using EOTech, it is because that is what they individually want to use. 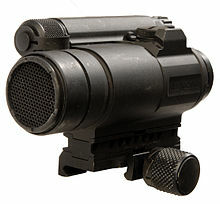 The military even has our very own “invented here” red dot sight called the M68 (made by Aimpoint). I have used this sight in close quarters and to hit targets out to 300m and found it produced superior results to using iron sights, both in accuracy and speed of engagement. But I recommend taking the honeycomb off the front lens to let more light in. This entry was posted in Current Events, Defense, Guns, Stupid. Bookmark the permalink. You keep writing this $h!7 and I might start liking you. WOOHOO! Profits can’t be far behind! My first reaction to stories like this (other than to be disgusted by the illiterate and ignorant commenters) is to wonder how prevalent the problem actually is. Eotech has been making optics for many years. Is it possible that this is a bad batch or is this an ongoing problem with the whole company? How is it possible that a company could make crap for this many years without anyone noticing? That seems unlikely to me given the number of sites devoted to testing gun parts. So I did a quick search. Item 1: http://www.eotechlawsuit.com/ Some lawyer warns you that even though Eotech will give you your money back, you shouldn’t because you would give up your right to thousands of dollars in a class action suit. Wait, what? Why the hell do you need thousands of dollars because your rifle optic (which you presumably have taken to the range on a regular basis and practiced with and had no issues with) might have had a problem if you suddenly went to the desert or the arctic with it? Unless you are in the military the chances of a defective Eotech sight having any effect on your life or well being are virtually nil. Even if you are a police officer, how often do they use these sights further out that about twenty five yards or so? Item 2: http://www.military.com/daily-news/2016/01/21/eotech-breaks-silence-over-defective-sights.html Reading a longer article that doesn’t contain so much hyperbole, the company points out that the issue primarily occurs when the sight is subject to significant temperature shifts. The example they give is room temperature to -40 or 122 degrees F. While this may be an issue with our military stationed in the sandbox (or fighting in the Arctic, I guess) it isn’t going to affect most people who aren’t military and certainly isn’t risking the lives of any civilians, including police officers. It seems to me that this is another overreaction. Should the company have been more forthcoming? Probably. Are they paying for it with the settlement and the offer to rebuild any affected sights, as well as in negative publicity? Sounds like it. Is this quite as horrible as it is made out to be by the commenters and the lawyers? Probably not. I think it may also be hyperbole to call these sights “defective”. They are intended as Close Combat sights where engagement ranges are <100 m. The feature says they are missing targets at 200 m. Seems pretty typical. Lawyers are scum. They don't want you to be a satisfied customer because the settlements for the lawyers are larger if they have more "customers" in the class. That is why they advertise on TV for people with mesothelioma. In any case, the Aimpoint sights are a huge improvement over iron sights, are cheaper than EOTech, and don't have these issues. Any true optical sight (no electronics), like Trigicon ACOG is also going to be immune to these kinds of problems. And As you pointed out, the problem is not that big a deal to the special operators in the military because they can instantly replace them with other sights and choose not to. Are we sure that the Aimpoint sights don’t have this problem or is it just that no one has taken their Aimpoint from -44 to 122 F to test it because everyone is using Eotech? Everyone isn’t using eotech. Aim point is the standard optic for the us army. So if it were a problem, someone would have mentioned it. I suspect the difference in technology is significant. Google can tell you.